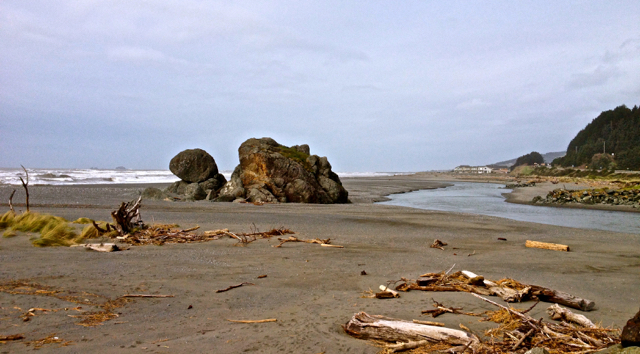 A fifty mile drive to Gold Beach, Oregon was all I could manage today. Yesterday’s windy walks made my eyes a bit sore; even wearing sunglasses. Gold Beach was named after a beach near the Rogue River where there was placer mining for gold in the late 1800s. Turtle Rock RV park is named for the rock formation on the beach, just a short walk under the Highway 101 bridge. The beach goes on for miles. I enjoyed an afternoon of walking and playing tag with the waves. This entry was posted in Uncategorized and tagged A Month Of Sundays, GRATITUDE, HOME ON THE ROAD, tincantravelerPhotos. Bookmark the permalink.